It’s been a busy month here at Cool Milk beginning to undertake our NSPCC charity work. We’ve began our partnership with the NSPCC by them helping us to understand what they do. On Monday 9th October, Claire and Sara from the NSPCC came to visit and told us about how the NSPCC talks to children about abuse in schools. They started their presentation by informing us of how they inform and help children to understand what abuse is depending on their ages. Divided between key stages, the NSPCC helps them understand what is okay, and what isn’t in terms of personal boundaries. We were informed of how they spoke to children in assemblies and what kinds of workshops are done with school children on visits. The workshop – given to years five and six children – allows the children to discuss with NSPCC staff thoughts and feelings and how to recognise abusive behaviour. This clarity allows us at Cool Milk to know and understand the charity better and know exactly how they aim to reach and safeguard children in schools. Inspired by the NSPCC’s visit, Cool Milk is planning a Halloween fundraiser in the ‘Go Green for Halloween’ NSPCC charity work campaign. On 31st of October, we’ll be wearing green inspired fancy dress, have a spooky bake sale and have some fun little fundraising games. The photo featured is of Alex Mihai, our HR officer, John Sedgwick, our managing director and Claire and Sara from the NSPCC. 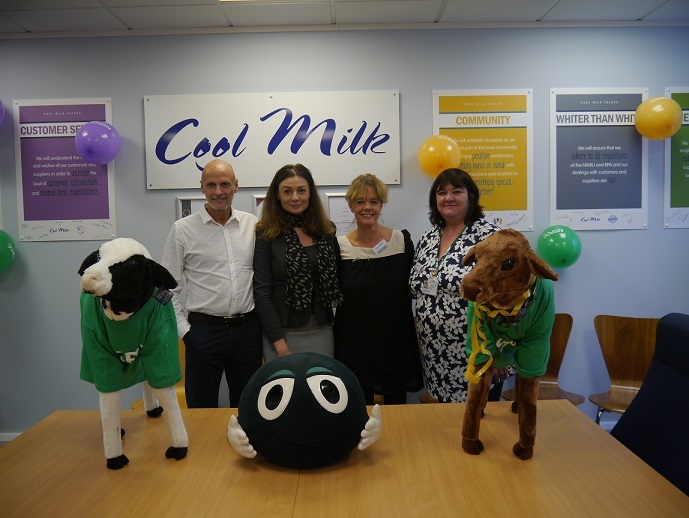 With a little more understanding of the work that they do when reaching out to children, Cool Milk hopes to work hard to help the important work the NSPCC does.